In setting a multinational transfer pricing, a company will usually concentrate on satisfying a single objective, namely: “minimize income taxation“. The four objectives stressed for domestic transfer pricing—goal congruence, motivation, autonomy, and performance evaluation—are considered secondary. In their study for the National Association of Accountants, Benke and Edwards asserted that “the advent of U.S.-based multinational corporations and their continued growth have added another, more complicated dimension to transfer pricing“. This post illustrates the economic benefit to a company of using a favorable transfer pricing to shift profit from a country with an unfavorable tax structure to one with a favorable tax structure. Enjoy! 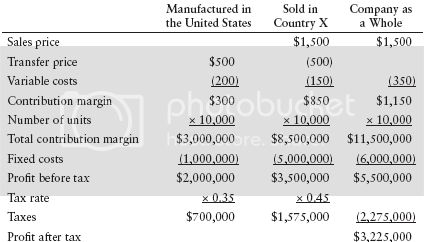 Let’s assume, a product Q is manufactured in the United states where the tax rate merely for the purposes of this illustration is assumed to be 35% and sold in Country X where the tax rate is assumed to be 45%. In the next table, the transfer price is set equal to $500 per unit. Clearly, it is economically advantageous to raise the transfer price. In so doing, less of the profit before tax will be shifted into Country X (with its higher tax rate of 45% relative to the lower 35% tax rate in the United States). In the next table, the transfer price is set equal to $800 per unit to show how transfer pricing can be a highly potent weapon when used to minimize income taxes. 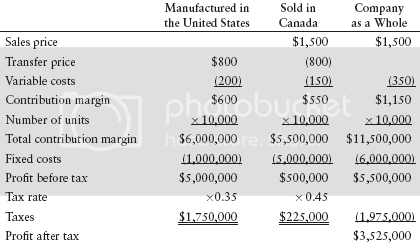 as clearly evident, the transfer price of $800 per unit (instead of $500 per unit) has caused a shift of $3 million of profit before tax from Country X to the United states. the difference in income tax rates, 10% (45% – 35%), times the $3 million, results in $300,000 savings in total income taxes ($2,275,000 – $1,975,000). By minimizing income taxes through use of transfer pricing, the company increased its total after-tax profit by a corresponding $300,000 ($3,525,000 – $3,225,000). Tax authorities are concerned about the transfer pricing methods of corporations doing business in their country, recognizing that corporations will seek to maneuver profits by employing a transfer price method to minimize profits in high-tax countries and maximize them in low-tax countries. A 2001 report by the U.S. senate alleges that multinational corporations evaded up to $45 billion in U.S. taxes in 2000 by using transfer pricing to manipulate income.3 the same report details one company selling toothbrushes between subsidiaries for $5,655 each! Traditional methods and nontraditional methods. Traditional methods for determining the arm’s-length price include: comparable uncontrolled method, cost plus method, and resale price method. The nontraditional methods, referred to as transactional profits methods, include the profit split method and the transactional net margin method. The comparable uncontrolled method is basically the sale price as would exist between unrelated corporations. The cost plus method is the transfer price method described on my previous post. The retail price method (also referred to as the resale minus method) begins with the sale price to an unrelated entity and subtracting an “appropriate” gross margin from that price. The conditions under which the sale would take place between two unrelated entities performing similar activities, employing similar assets to manufacture the product or conduct the service, and exposing the parties to similar business risks are used in establishing the appropriate gross margin. The two transactional profit methods. Are regarded as methods of last resort for determining the arm’s-length price. the profit split method, the more commonly used of the two transactional profit methods, is employed when the integration of the parties involved in the transaction who are operating in different countries is so great as to make a separate evaluation of the transfer price extremely difficult. The profit split method divides the profit from the transaction between the two parties based on some reasonable factors for both the parties in the transaction. In turn, an appropriate measure for the factor or factors must be determined that is acceptable to tax authorities. the factor could be the level of contribution made by both entities to the transaction. The arm’s-length price based on the transactional net margin method, the newest method of the OECD approved methods, is obtained by estimating the net profit margin made from the controlled transaction relative to an appropriate base. Depending on the nature of the transaction, the base could be a financial ratio such as net profit to sales or return on assets employed. This method is becoming more widely used. Preference for any particular method is not given in the OECD guidelines. instead, the guidelines indicate that the method that should be employed is the one that most directly and reliably reflects arm’s-length conditions in a particular transaction. National tax authorities, however, may have a preference. The tax risk that a company faces is that a national tax authority will require the restatement of income under an alternative method, leading to a higher income and additional taxes due plus penalties. For example: on September 2006, Glaxco Smith Kline announced a settlement with the U.S. Internal Revenue Service (IRS) in which it agreed to pay in excess of $5 billion in taxes resulting from an assessed income adjustment due to improper transfer pricing. The dispute between the company and the IRS involved Zantac, a highly profitable ulcer drug. The issue was whether it was the research and development undertaken in the U.K. or the advertising and marketing of the product in the United State that made the product valuable. While both were major contributors to the value of Zantac, determining the relative contribution and allocating profits accordingly was not a simple task. The IRS disagreed with the method adopted by Glaxco Smith Kline. Typically, any noncompliance penalty will be assessed against the taxpayer. The penalty can be substantial. For example, noncompliance penalty in the United States, referred to as an “accuracy-related penalty,” as set forth in section 482 of the transfer pricing regulations can be either 20% or 40% on the additional tax due. The rules for determining whether the penalty is 20% or 40% are explained in IRC section 6662. In Canada, revenue Canada applies a 10% penalty to the adjusted income or loss due to transfer pricing. Canada, unlike the United States, levies a penalty even if there is no change to the tax liability. Documentation establishing the structure and relationship of a business within the same group, including the business nature of each company. Budgets, business plans, and financial projections. Documentation establishing the business strategies and the reasons for their adoption. Documentation establishing the sales, operating results, and the nature of its dealing with associated enterprises. 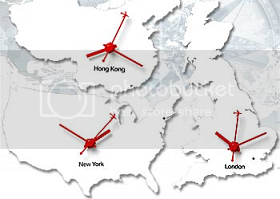 Documentation establishing the reasons for entering into international dealings with associated enterprises. Pricing policies, documents relating to product profitability, relevant market information, and profit contributions of each party. Documentation establishing the reasons for selection of pricing methodology or methodologies. In the case where several pricing methodologies can be adopted, there must be documentation establishing details of other methodologies, and reasons for the rejection of using such methodologies. Documentation evidencing the negotiating positions taken with associated enterprises. Other documentation that is relevant to the pricing methodologies, if any. The Advance Pricing agreement (APA) Program is designed to resolve actual or potential transfer pricing disputes in a principled, cooperative manner, as an alternative to the traditional adversarial process. An APA is a binding contract between the IRS and a taxpayer by which the IRS agrees not to seek a transfer pricing adjustment under IRC-482 for a covered transaction if the taxpayer files its tax return for a covered year consistent with the agreed transfer pricing method. The APA Program provides a voluntary process whereby the Internal Revenue Service and taxpayers may resolve transfer pricing issues under 482 of the internal revenue Code, the income tax regulations there under, and relevant income tax treaties to which the United States is a party in a principled and cooperative manner on a prospective basis. The APA process increases the efficiency of tax administration by encouraging taxpayers to come forward and present to the service all the facts relevant to a proper transfer pricing analysis and to work towards a mutual agreement in a spirit of openness and cooperation. The prospective nature of APAs lessens the burden of compliance by giving taxpayers greater certainty regarding their transfer pricing methods, and promotes the principled resolution of these issues by allowing for their discussion and resolution in advance before the consequences of such resolution are fully known to taxpayers and the Service. [Internal Revenue Code-482: Allocation of income and deductions among taxpayers, January 9, 2006, p. 2]. In countries where there is an APA, there is usually a fee. For example, in the United States, the fee is generally $50,000 and a renewal APA fee is $35,000.